It has been about a month since Route, a Kemps ridley sea turtle has left the aquarium medical center to take up temporary residence in the West Wing Sea Turtle Recovery Ward. [The space that housed the Sea Turtle Recovery Room is now The Trust Family Foundation Shark and Ray Touch Tank. Rescued sea turtles are now cared for at the new, much larger Animal Care Clinic in Quincy.] There the turtle is continuing rehabilitation as the 2008 cold-stunned sea turtles get closer to release. We have recently stopped antibiotic therapy on this turtle because we learned that the cultures we sent out on 2/25/09 are negative for any growth. Route is still on an antifungal medication while we await the results of those cultures. Fungal cultures take on average about 2-3 weeks longer than bacterial cultures to get final results back. Route has started doing physical therapy on its own, using the systems outflow as a sort of water treadmill. The turtle will swim against the current in one place for quite a while in between sleeping and eating. Although most of the left front flipper (LFF) was removed the turtle is starting to use it fairly effectively while turning and accelerating. Route has also gained over 1 kg (2.2 lbs) in the past month, increasing its body weight by approximately 16%. We can really feel the added mass when we bring the turtle out for exams. Clinically the turtle is doing excellent. Eating and swimming well. 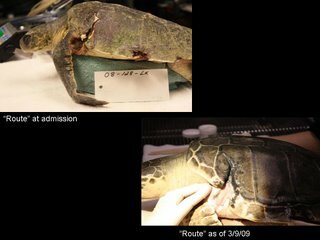 The wounds are healing and we are extremely confident that the turtle will be released this summer. As you can see in the picture, the large crack on the carapace is healing well. My daughter and I were at the aquarium when Route was operated on and we've been following Route's progress. I'm glad things are going well.